The phenomenon of cheating in higher education is of overwhelming importance in that the students engaging in these acts are unlikely to have the skills necessary for their future professional life. 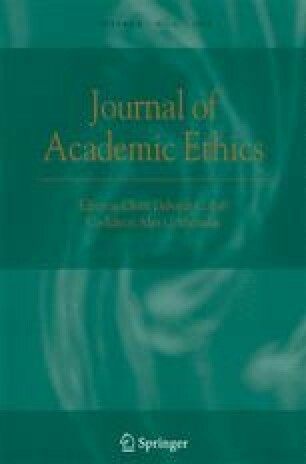 Despite its relevance, the empirical evaluation of cheating in universities has been almost exclusively focused on the US context. Little is known about cheating at the European level, let alone in Portugal. Even less is explored at the regional level. In this paper we present evidence on the perception of cheating by Portuguese undergraduate students of economics/business degrees. We undertake a large-scale survey, involving 2675 students from all Portuguese mainland public universities (10). We found that copying-favourable environments are associated with a higher propensity to cheat. Moreover, in universities where ‘codes of honour’ exist, this propensity tends to be lower. Finally, the propensity to copy seems to be highly influenced by the cultural systems and socially-related factors of different regions. We are deeply indebt to all students that responded the survey and to the following individuals (in alphabetic order) for permitting and/or implementing the questionnaire underlying this study. Directors: Antonieta Cunha Sá (UNL/University Nova of Lisboa), Artur Cristóvão (UTAD/University of Alto Douro e Tràs-os-Montes), Fernando Almeida (Economics and Management School/University of Minho), Joaquim Borges Gouveia (Economics, Business and Industrial Engineering Department/University of Aveiro), José Pereirinha (ISEG/University of Lisbon), José Silva Costa (FEP/University of Porto), Manuel Branco (Faculty of Economics/University of Évora), Paulo Rodrigues (Faculty of Economics/University of Algarve), Pedro Botelho (FEUC/University of Coimbra). Department Coordinators: Carlos Arriaga (Economics Department/University of Minho), Fernanda Nogueira (Bussiness Department/University of UTAD), José Caldas (Economics Department/University of UTAD). Professors/Researchers: Ana Maria Rodrigues (University of Coimbra), António Caleiro (University of Évora), Arménio Rego (University of Aveiro), Aurora Galego (University of Évora), Carla Amado (University of Algarve), Carlos Ferreira (University of Aveiro), Carlota Quintal (University of Coimbra), Efigénio Rebelo (University of Algarve), Elisabete Félix (University of Évora), Fernando Cardoso (University of Algarve), Francisco Torres (University of Aveiro), Henrique Albergaria (University of Coimbra), Joana Costa (University of Beira Interior), João Paulo Costa (University of Coimbra), José Belbute (University of Évora), José Novais (University of Évora), Margarida Saraiva (University of Évora), Maria Graça Baptista (University of Açores), Maria João Alves (University of Coimbra), Maria João Carneiro (University of Aveiro), Maria João Thompson (University of Minho), Miguel Lebre de Freitas (University of Aveiro), Óscar Afonso (FEP/University of Porto), Patrícia Valle (University of Algarve). A final word of appreciation to Luzia Belchior (FEP—Administrative Office) for her valuable assistance with the optical reading of the survey questionnaires.